Hey Tribe: We'll be posting a follow-up episode on "Low Inflammation Diet & How to Read Labels" by Dr. Jenny Pfleghaar, DO, on August 6th, 2018. Be sure to subscribe to our podcast so you don't miss it! Is your daughter (or son) a frequent sufferer of joint pain, fatigue, frequent fever, or irritability? These could be symptoms of one of a group of inflammatory and autoimmune conditions that fall under "Junior Rheumatoid Arthritis." One of our guests this week was diagnosed with JRA as a kid, and a doctor believes it was triggered by recurrent Strep infections. She explains what her life was life in the past, and how as an adult has learned to deal and even rise above her illness using holistic methods such as yoga, muscle-strengthening cardiovascular exercise, positive attitude, chiropractic care, and clean eating. 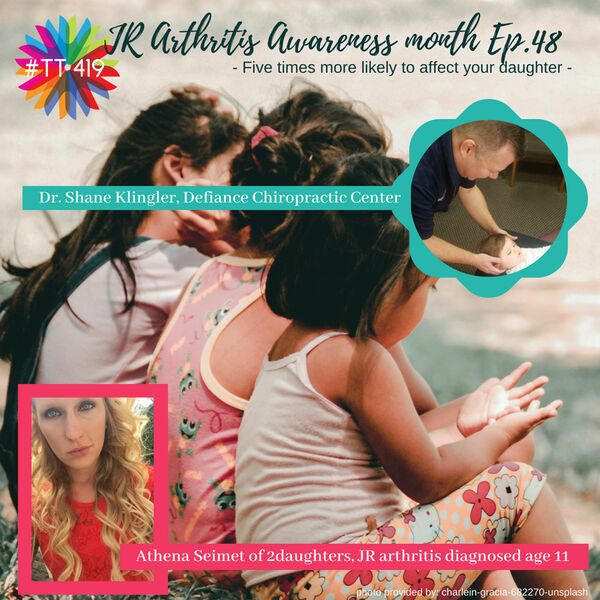 Our second guest, a chiropractor who specializes in pediatrics and pregnancy, gives us some technical information about JRA and how it may be approached in a chiropractic setting, and what parents should look for in a qualified peds Chiropractor. Athena recommends checking out Vitality Yoga on Facebook.